Shotguns have been overtime the most effective mean of personal protection due to its ease of use and tremendous power, and it is now one of the best ways to protect your home from forcible entry as well as protecting one’s boat from high seas piracy common to these days. Shotguns are ideal weapons to have in the event of a post hurricane survival time, where law enforcement is either to busy or simply not available to come to your help. Our shotgun class will teach you how to safely and efficiently use, maintain, load, unload and store a shotgun for the protection of your home, family and self. You will learn about the different types of shotguns currently in the market, their use, and which one is the most appropriate for your personal defense. You will get to know about the various type of ammo to meet your specific needs for your safeguard and the one of your family. Knowledge of the different types of shotguns and their use. Different aiming technique and their appropriate use. 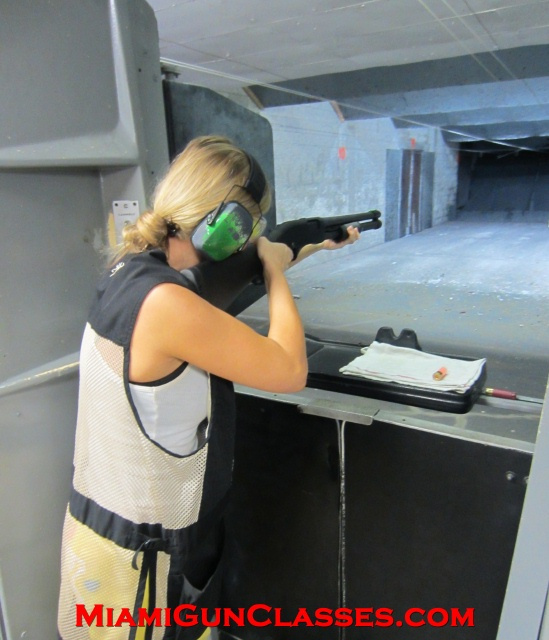 Our instructor has over 20 years of active and defensive shotgun use and will provide you with a comprehensive class in a no boot camp environment. * Classes are expected to last two hours. Review of the shotgun specifics. Shotgun for the home protection. Shotgun for boaters or vessels protection. Appropriate ammo for short range defense (home protection). Appropriate ammo for long range (boaters use). Tactical loads and their use. Commune tactical or defense add-ons. Multiple target and decision making / shot placement. *Classes are expected to last two hours.